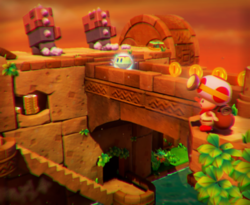 Walleye Tumble Temple is the second course of Episode 1 in Captain Toad: Treasure Tracker. This level takes place in a ruins with a lake and Walleyes. The layout of the course. Captain Toad starts at a high point where it seems that a simple bridge leads to the Power Star, but when the Captain crosses it, the bridge collapses and he falls into the water below. After crossing the lake on rotating bars, as well as turning wheels inside the temple, Captain Toad ascends to the other side of the bridge, dodges more Walleyes and obtains the Power Star. Super Gem 1: On the strip of land under the bridge. To get here, Toad must wait on the rotating platforms that provide access. Super Gem 2: At the end of the first hallway in the temple, behind a rotating passage. Super Gem 3: On the other end of the first bridge; accessible from the other side. Didn't destroy the temple's bridge! The Pixel Toad is inside the temple behind the upper-right most turning wheel, visible when the wheel is in a vertical position. The player can find a hidden 8-bit Luigi on the end of the left wall of the corridor behind the first Walleye.